In the beginning, before there was any recognised form of writing, oral narratives were the only way of preserving memories of what had happened. People passed down the experience that would benefit those who followed. As writing developed, generational knowledge was easier to preserve. Faster progress could be maintained. Except, of course, people can lie to each other whether by spoken or written word. History is one of the more abused cultural artefacts, with facts misrepresented or manipulated to gain future advantage. Today, we’ve developed a multiplicity of different forms for transmitting information. However, one thing remains true. The line between history and fiction can and will always be blurred. 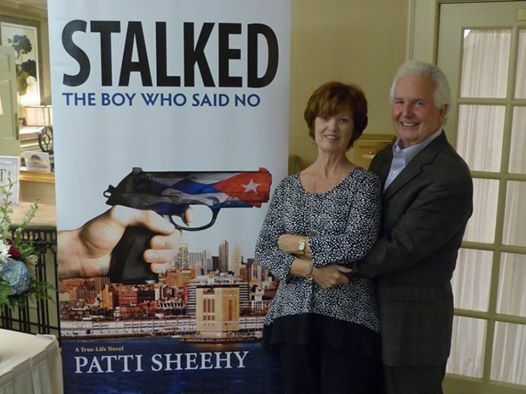 Stalked: The Boy Who Said No by Patti Sheehy (Oceanview Publishing, 2014) is the second and probably concluding volume that tells the life history of Frank Mederos, a Cuban who escaped from his native country and made a life for himself in the United States. It’s relevant to draw your attention to the author’s name. In other circumstances, this might have been an autobiography, ghosted by Ms Sheehy. As it incorporates a significant number of fictionalised scenes, recreating what the protagonist assumes happened, the “author’s” input is too substantial to ignore. We perhaps should therefore view this as a novelised autobiography, or a straight biography, or consider the whole a piece of historical fiction. Why, you ask, should this question of the label matter? Well, the book is presented to the readers as a “true life story of romance, suspense, and intrigue”. If we take this as an accurate version of what Mederos told his scribe, we can attribute all the prejudices on display to him. The American amanuensis is doing no more than channel his words to us. She is not at fault in any way. But if she is promoting the notion that everything that happened in Cuba was evil and most of what happens in America as the land of opportunity is good, historically speaking, that’s not uncontroversial. For example, Mederos arrives in New York in 1967 and pays a quick visit to the race riots in Newark. What makes this interesting is that the riots are not given any real context or explanation. Even more interesting is that Mederos himself never seems to be the victim of any discrimination based on his nationality or his inability to speak English. His can-do attitude is lauded and he gets the results he needs in order to become a successful small-scale businessman. He’s the epitome of what’s often held up today as everything that’s wrong with America. By welcoming immigrants, America is depriving its own citizens of jobs, and so on. Ironically, the federal government passed a “dream act” in the form of the Cuban Adjustment Act of 1959. Any native or citizen of Cuba who was physically present in the US after 1st January, 1959 and lived there for a year, was automatically deemed a permanent resident. In many circles, this was not a popular law and, under pressure, it was repealed in 1966. This book calmly glosses over all the racial and ethnic problems of the day and, instead, focuses on the inefficiency and corruption in Cuba to the exclusion of all else. Indeed, Mederos is a hero because he defects and Lazo, who stays behind and spies for the CIA, is held up as an example of how every right-thinking member of a society should react when confronted by a regime he finds repugnant. In other words, this is a book written with every conceivable bias an American author should include to sell a book about the Cuban experience to the great American public. No matter what the truth might be, the black and white portrayed here is what sells the book. Even the fanatical communist who’s sent to stalk and kill Moderos questions his orders, seeing no threat to “his” country in the activities of this sandwich-maker. Hooray for America when even a trained assassin is subverted just by observing the lifestyle of a Cuban exile. This is not to say the book is without merit as a story of a man who joins the woman he loves in America, and tries to make a life for his family. I just wish that, as a book that’s promoted as “history”, it did not whitewash away all the problems in America, and see only the worst in Cuba. So if you are an American who wants a book to confirm your prejudices that America did everything right in dealing with the “threat” of Cuba on its doorstep, this view of American history from 1967 to 1980 or so is probably for you. But if you would prefer a book that presents the history with a little more depth and balance, Stalked: The Boy Who Said No is definitely not for you.